Sen. John McCain's latest political ad "Praising McCain" uses clips of prominent Democrats saying flattering things about the presumed Republican nominee and ends with a sharp dig at Sen. Barack Obama uttered by Hillary Clinton during her battle with the Illinois Senator for the Democratic nomination. The minute-long ad features laudatory comments for McCain's political independence from leading Democrats including Sens. Tom Daschle, John Kerry, Joe Biden, Russ Feingold, and Barack Obama himself. It concludes with a zinger from Sen. Hillary Clinton, who criticizes Obama's relative inexperience. "I think that I have a lifetime of experience that I will bring to the White House. 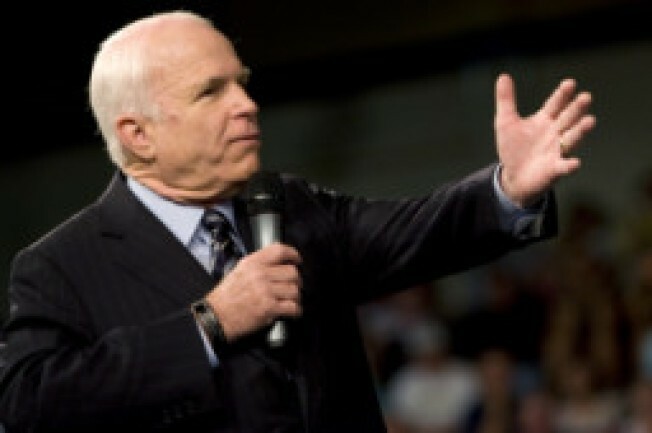 I know Sen. McCain has a lifetime of experience that he will bring to the White House. And Sen. Obama has a speech he gave in 2002." The Washington Times notes that McCain has excelled with his online ads recently, with the candidate's YouTube channel beating Barack Obama's for seven straight days and 11 of the last 14. He was no doubt aided indirectly by the popularity of Paris Hilton's ad, which mocked him as an "old white-haired dude." Ariana Huffington thinks that the only way McCain can win the election is by avoiding the issues and turning it into a carnival sideshow. The seeming effectiveness of McCain's ad this week is a turnaround from one he ran last week, which received serious criticism that it was attempting to portray Obama as the Antichrist. Last week's ad employs religious imagery and phrases making Obama appear to be promoting himself as the world's savior.